The National Fire Research Laboratory aims to make buildings better and safer. When the voice over the intercom announces, “We are clear for ignition,” instead of the deafening roar of a rocket engine, here at the National Fire Research Laboratory (NFRL) in Gaithersburg, Maryland, things stay pretty quiet. Inside a 9.1- by 4.6-meter (30- by 15-foot) wood structure furnished like a studio apartment, a firefighter crouches in the corner. He uses a propane torch to light a small gas pilot flame, then leaves to join his colleagues outside, where they will wait…and watch. The structure sits beside an identical one in the middle of the lab’s massive high-bay. The bay’s precisely engineered floor measures 18 by 27 meters (60 by 90 feet), and its ceiling disappears into shadow more than 12 meters (41 feet) above. What appears to be a giant canvas tent suspended from the ceiling is actually an exhaust hood, ready to guide smoke and gases from the fire into an environmental control system that will scrub toxins from the air before it’s released outside. 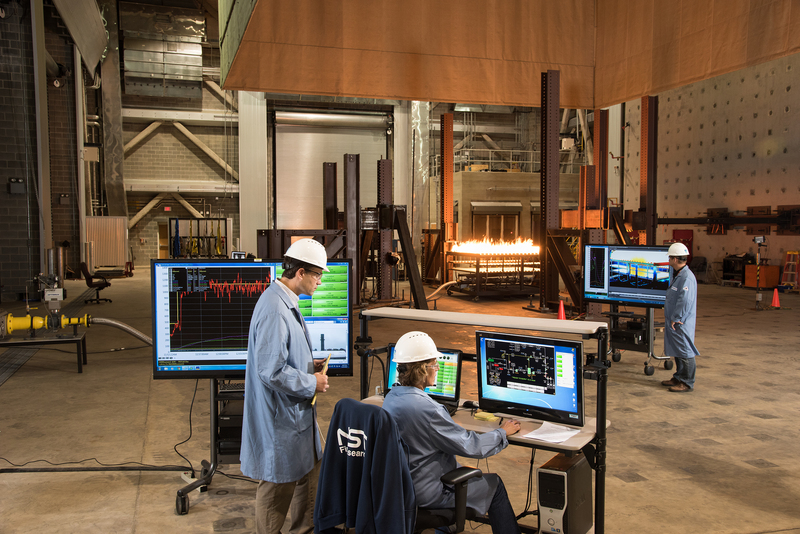 NIST engineers operate various imaging systems to document a structure’s behavior during a fire test. The lead-up to a test like this can take years. The NFRL, which is part of the National Institute of Standards and Technology (NIST), got involved in this project in 2016, but the National Research Council Canada and its partners at the Fire Protection Research Foundation had spent the preceding two years preparing for it. The entire experiment—which involves the construction and burning of six identically furnished rooms over the course of eight weeks—focuses on determining how a new type of construction behaves in a fire. Called cross-laminated timber, this type of construction material is currently approved for buildings with up to six stories. Designers would like to use it in taller buildings because it is environmentally sustainable and can speed the construction process. To use it for those taller buildings, the industry needs to understand how the timber would perform during a fire, so these experiments are measuring its structural performance and the amount of energy the timber contributes to the fire. Researchers at the National Institute of Standards and Technology (NIST) worked with the National Research Council Canada and the Fire Protection Research Foundation to test the performance of a building material called cross-laminated timber. 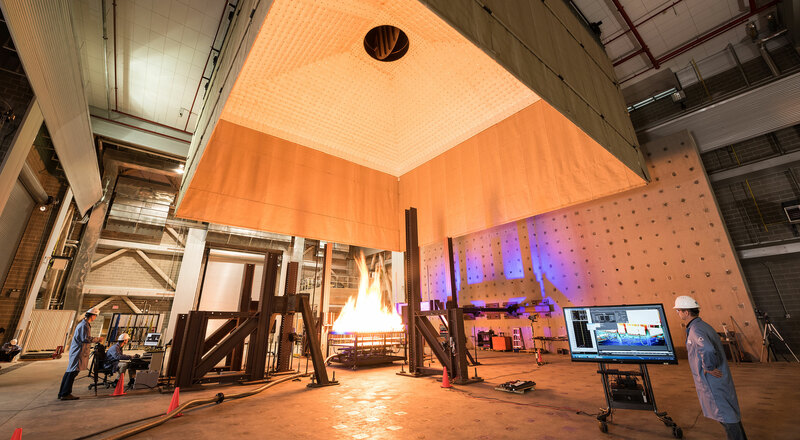 Over the course of eight weeks at NIST’s National Fire Research Laboratory, the team burned six identical structures to collect data such as the energy release rate, gas emissions and charring patterns. As Bundy and the project team look on, the fire in the test room spreads from a small gas burner to a side table. It grows to consume a kitchenette, a couch, a bed and eventually climbs the walls of the compartment. Multiple cameras record the fire’s growth, capturing a dramatic scene as the room brightens and then becomes obscured by thick, black smoke descending from the ceiling as a thick mass. The smoke finds the door and pours out and up toward the exhaust hood. About 10 minutes into the test comes the flashover, when all that smoke bursts into flames. These fire research experiments are just the latest that NIST has been conducting since the early 1900s. NIST’s research has helped improve product safety codes for fire resistance for a variety of products, including furniture, children's sleepwear, automatic sprinklers and even cigarettes that are less likely to start a fire. The research also has led to modernized building codes and computer models that can predict the behavior of fire, smoke and toxic products. These computer models are now widely used for training firefighters and guiding fire protection engineering. NIST has been conducting fire research since its earliest days. This 1922 photo shows NIST researchers observing a structural fire. In addition to laboratory work, for more than 90 years NIST researchers have conducted on-site investigations of building fires and structural failures, often leading multi-organization studies of these disasters. NIST’s exhaustive, six-year investigation into the World Trade Center disaster not only revealed the need for a new type of facility to test the fire performance of real-scale structures, but it also led to a total of 40 changes to national and international model building and fire codes. In 2015, construction was completed on an expansion to NIST’s existing fire research laboratory, which had been in use since 1973. The expanded facility can hold structures up to two stories tall and contain fires up to 20 megawatts of peak energy. That’s equivalent to a small home engulfed by fire and double the heat release rate capacity of the previous fire laboratory. “NIST has a very long history of conducting problem-oriented and applied research in the area of fire safety"
In addition to increasing the scale of the fires that could be studied in the lab, the expansion added the ability to combine fire science and structural engineering. A new system allows researchers to apply forces to the components of a structure—its beams, columns, floors and walls—to simulate the pushes and pulls of a much bigger and heavier building. “We can use hydraulic actuators, which are devices used to generate a mechanical force to apply typical gravity forces on a multistory building,” says Lisa Choe, a research structural engineer at the NFRL. The actuators pull on the structure through any of 1,218 holes in the 1.2-meter thick “strong floor,” or through 420 holes in the vertical strong wall, which simulates forces in a wider building than can be built in the lab. “What this means is we can squish it at the same time we burn it,” says Nelson Bryner, chief of NIST’s Fire Research Division. The World Trade Center disaster highlighted the need for this capability, says Bryner. That was because before Building 7 of the World Trade Center (WTC 7) collapsed, a high-rise in the United States had never been brought down by fire. The heat from the uncontrolled fires in WTC 7 caused steel beams to expand and become displaced; the building no longer functioned as designed. “We didn’t appreciate that fire could impact structural integrity to the point of causing that entire building to fail,” says Bryner. 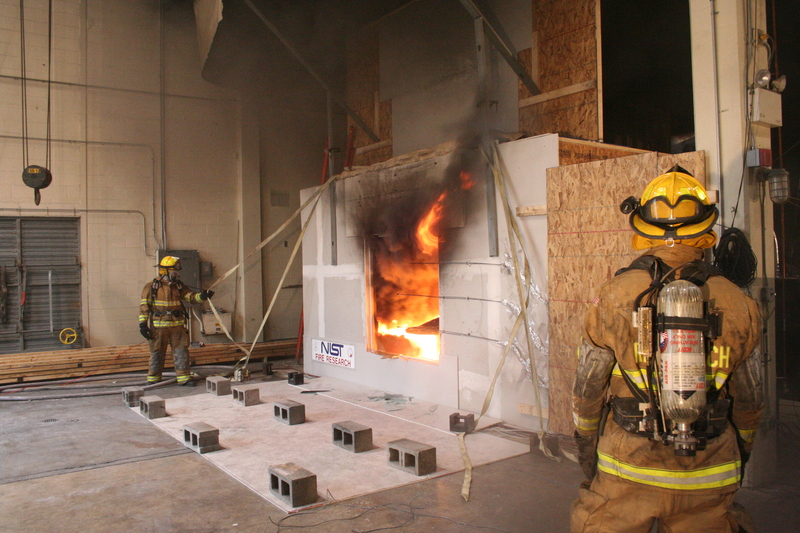 The experiments conducted at the expanded facility will generate a more realistic set of data indicating how a real structure would behave in a fire. The researchers are looking to capture two categories of measurements: fire-related (the heat release rate, temperatures and heat fluxes) and structure-related (forces, strains and displacements). During a calibration burn, NIST researchers measure heat release rate (foreground) and monitor high-definition thermal images (background). Bringing together two research areas has brought changes to the lab that Bundy welcomes. “Before the new lab, the focus was solely on fire-related projects, and our staff did not typically develop experimental plans. We had researchers come and bring us concepts that we would execute,” he explains. The newly expanded National Fire Research Laboratory (NFRL) at NIST allows researchers to study how entire office buildings, hospitals and bridges react to fire under controlled laboratory conditions. This extraordinary nearly 2,000 square meters (21,400 square feet) research facility provides the means to greatly strengthen the scientific basis for improved fire protection standards and new innovations in building materials and design. Hoehler, for example, worked in earthquake engineering before he joined the NFRL in 2014. Despite the inevitable cultural differences between different research disciplines, the transition to having structural engineers working side by side with fire scientists has been pretty smooth, both researchers say, and they’ve been learning from one another. “I see the structural guys getting excited about the heat release and temperature gradient and gas concentrations, things that aren’t in their training,” says Bundy. Structural engineer Hoehler says he has gained greater appreciation for the concept of uncertainty since joining NIST’s Fire Research Division. For measurement scientists, a measurement isn’t complete until you determine how uncertain it is, based on the limitations of your tools and understanding of the measurement. Source: National Fire Protection Association. Instead, uncertainty is accounted for in engineering practice by using “safety factors,” basically designing structures to be stronger than they need to be. As researchers do a better job characterizing the uncertainty in their work, says Hoehler, structures can be designed more efficiently. After several hours of attentively watching the final cross-laminated timber structure burn, the firefighters move in to extinguish the flames. The next day, the team deconstructs what is left of the rooms and removes the debris so that construction for the next series of experiments can begin. Next up is a project to evaluate the fire performance of steel and concrete composite floor systems, led by Choe. She came to NIST shortly after finishing graduate school in structural engineering, where she had the opportunity to study fire even though it wasn’t necessarily her intention. “Graduate students often don’t have a choice. The professor gets the research funding,” explains Choe, who is quite happy to have had that early fire research experience, which led her to NIST. Her advisor’s funding from the National Science Foundation and NIST was for an investigation of structural steel members at elevated temperatures. But in a university setting, burning an entire structure is usually not an option. Instead, Choe used radiant heaters to heat building materials, such as steel beams and concrete slabs, that were noncombustible. Choe and others have been working on the composite floor project for several years already. There was the initial planning and then stakeholder meetings with experts from different countries and fields, from industry and academia. Throughout the summer and fall of 2017, her team will conduct five burns to determine how a fire affects the performance of 13-meter (42-foot) composite beams. This will be the first test at the new NFRL that will fully use its structural load capabilities. The composite floor systems Choe is studying and the cross-laminated timber Hoehler and Bundy burned are just two examples of building materials that need to be studied. At the National Fire Research Laboratory at NIST, fire researchers and engineers have come up with very creative and innovative ways of capturing great fire video footage. Writing and research contributed by Jonathan Sunderman.